4. Expanded research at the intersection of hydrological sciences and the technical, social, economic, and political aspects of freshwater management and use. Peter H. Gleick , Heather Cooley , James S. Famiglietti , Dennis P. Lettenmaier, Taikan Oki , Charles J. Vörösmarty , and Eric F. Wood. 2013. 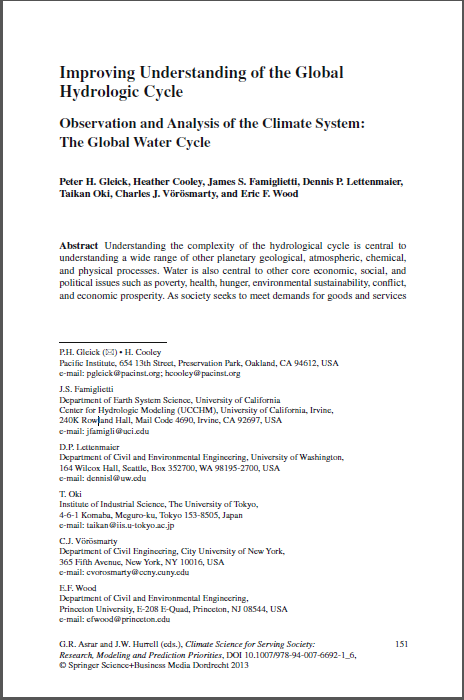 “Improving Understanding of the Global Hydrologic Cycle: Observation and Analysis of the Climate System: The Global Water Cycle.” In G.R. Asrar and J.W. Hurrell (eds. ), Climate Science for Serving Society: Research, Modeling and Prediction Priorities, 10.1007/978-94-007-6692-1_6. Pp. 151-184. Springer, Dordrecht.